UEC-ERATO Symposiums were held in UEC. Feb. 1, 2019Nishiyama from The University of Electro-Communications received Promotion and Nurturing of Female Researchers Contribution Award (Kashiko Kodate Award) at JSAP. NEW! Dec. 17, 2018Nakajima from The University of Electro-Communications received The Best Oral Paper Award at LSJ workshop. NEW! Nov. 02, 2018Kato from The University of Electro-Communications received OPJ Award at OPJ2018. Oct. 31, 2018 Double prize ! Asahara from The University of Electro-Communications and Minamikawa from Tokushima University received Optics Paper Awards respectively at OPJ2018. Oct. 29, 2018Mizuno from Tokushima University received Outstanding Presentation Award at The 41th Japanese Society for Medical and Biological Engineering meeting, Chugoku Shikoku Branch. Apr. 27, 2018Ikisawa from The University of Electro-Communications received The Best Student Poster Paper Award at ALPS2018. Apr. 27, 2018Tanaka from The University of Electro-Communications received The Best Student Oral Paper Award at ALPS2018. Apr. 23, 2018UEC-ERATO Symposium(Optical Frequency Comb and Ultrashort Pulse Laser) was held in UEC. Mar. 19, 2018Kato from The University of Electro-Communications received Photonics division Award at The 65th JSAP Spring Meeting, 2018. Mar. 10, 2018Okuda from Keio University received Outstanding Oral Award at The 2nd Asian Workshop on Molecular Spectroscopy. Feb. 23, 2018Mizuno from Tokushima University received Hamamatsu Best Paper Award at SPIE Photonics West 2018/BiOS2018. Nov. 11, 2017Okubo from AIST and Iwakuni from Keio University received APEX 10th anniversary collection at JSAP. Nov. 02, 2017Uchida from The University of Electro-Communications received OPJ Award at OPJ2017. Sep. 20, 2017ERATO Symposium was held at 2017 JSPE Autumn Meeting. Sep. 14, 2017Zhang from The University of Electro-Communications received OSA/SPIE Student Paper Award at ICO-24. Aug. 26, 2017UEC-ERATO Symposium(International Symposium on Optical Frequency Comb) was held in UEC. Aug. 25, 2017UEC-ERATO Symposium(Special Lecture on Optical Coherence Tomography) was held in UEC. Aug. 24, 2017JST ERATO Joint Symposium was held at ICO-24. Jun. 05, 2017Uchida from The University of Electro-Communications received The Best Student Oral Paper Award at ALPS'17. Apr. 03, 2017Wang from The University of Electro-Communications received Award at The Workshop of Laser Society of Japan, Tokyo Branch. Mar. 30, 2017Ogawa from Tokushima University received LSJ Encouragement Award. Mar. 30, 2017Zhang from The University of Electro-Communications received LSJ Outstanding Paper Award. Feb. 18, 2017Minamikawa from Tokushima University received Best Presentation Award at The 2016 JSPE Autumn Meeting. Feb. 06, 2017Yoshida from The University of Electro-Communications received Outstanding Poster Presentation Award at the workshop of Laser Society of Japan. Jan. 06, 2017Asahara from The University of Electro-Communications received OPJ Award at OPJ2016. Dec. 03, 2016Mizuguchi from Tokushima University received Outstanding Poster Presentation Award at Photonics Division Meeting of The Japan Society of Applied Physics. Nov. 10, 2016Minoshima received Honorary Credential at AOE in China. Oct. 15, 2016Miyamoto from Tokushima University received Young Scientist Award at Japanese Society for Medical and Biological Engineering Meeting, Chugoku and Shikoku Branch. Oct. 05, 2016Yasui from The University of Electro-Communications received Outstanding Poster Presentation Award at The Contemporary Optics Research Meeting. Oct. 05, 2016Yoshida from The University of Electro-Communications received Outstanding Poster Presentation Award at The Contemporary Optics Research Meeting. Sep. 13, 2016Kato from The University of Electro-Communications received JSAP Award at The 77th JSAP Autumn Meeting, 2016. Sep. 13, 2016Shibuya from Tokushima University received JSAP Award at The 77th JSAP Autumn Meeting, 2016. Sep. 13, 2016Okubo from AIST and Iwakuni from Keio University received JSAP Young Scientist Award at The 77th JSAP Autumn Meeting, 2016. Jun. 06, 2016Nakajima from The University of Electro-Communications received Award at Optical and Quantum Devices of IEEJ. May. **, 2016Okuda from Keio University received Award for Excellent Presentations at The Symposium on Molecular Spectroscopy. Mar. 04, 2016Uchida from The University of Electro-Communications received Outstanding Poster Presentation Award at The Workshop of Laser Society of Japan, Tokyo Branch. Dec. 09, 2015Mizuguchi from Tokushima University received Student Poster Presentation Award at ACORE2015. Oct. 30, 2015Hase from Tokushima University received OPJ Award at OPJ2015. Sep. 15, 2015Ogura from Tokushima University received Best Student Paper Award at CLEO-PR2015. May. 13, 2015Minoshima was elected as a Fellow Member of The Optical Society (OSA). Aug. 19, 2014Nakajima from The University of Electro-Communications received Poster Award at The 4th Advanced Photonics Symposium. Dec. 19, 2013Minoshima was selected as NISTEP(The Researchers with Nice Step). 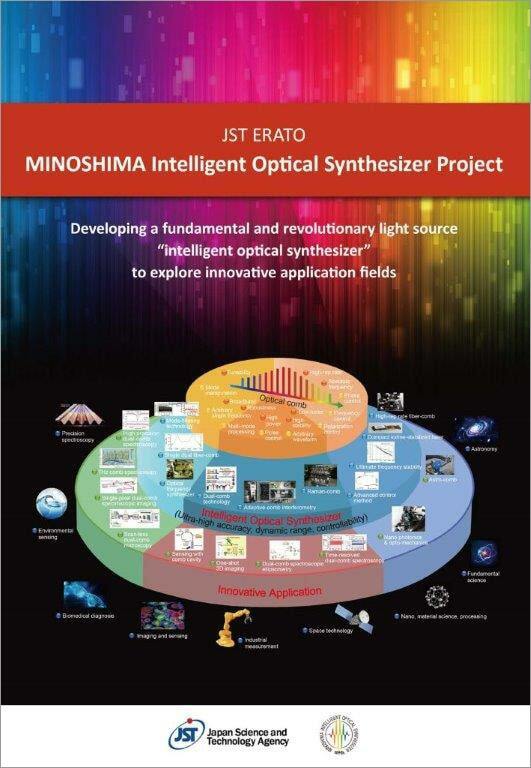 © JST-ERATO MINOSHIMA Intelligent Optical Synthesizer Project. All rights reserved.